Volunteers must register online. All volunteers must register by Monday, March 16, 2020, 11:59 p.m., or they will not be allowed to volunteer for the event. The volunteer age minimum is 16 years old and accompanying children are not permitted. We require that all volunteers be 16 years of age or older on the day they are volunteering. A Parent/Guardian must agree to the volunteer waiver for volunteers between the ages of 16 and 18 years of age. Children and young adults under the age of 16 are not permitted to accompany registered volunteers who meet the age requirement when they are volunteering. Volunteers are not allowed to speak to the media on behalf of the event. If you are approached by a member of the media please reply, ‘I am not an official spokesperson of the event,’ and direct them to the media phone number on the back of your credential. Wear your event volunteer uniform. You are expected to dress in clothing appropriate for the work duties you have been assigned to perform. When required, you must have visible appropriate and current event issued credentials and/or ID vests and wristbands to be on the premises. Dress appropriately for the weather. Wear closed toe shoes at all times and the current event attire logo hat, shirt or jacket, if provided. Drugs and alcohol are prohibited. Volunteers are required to report to work in appropriate mental and physical condition to perform their assignment in a satisfactory manner. Violations of this policy may lead to disciplinary action, up to and including termination of responsibilities. Violations may also have legal consequences. Volunteers may not consume alcoholic beverages, smoke cigarettes or use illegal drugs while working on event related projects, assignments or during event production hours. Treat all spectators, volunteers and race participants with courtesy and respect. Never block the path of race participants, throw items, yell or argue with participants, spectators, event staff or other volunteers. Any inappropriate conduct relating to race, ethnicity, gender, religion or physical disability is not tolerated. Listen to the instructions given by event staff, key volunteers and/or your group leader and be alert when performing your role. Event staff and key volunteers have received specific training on their area’s respective volunteer positions. Please listen carefully to their instructions and comply with what they ask of you. Volunteer and participant safety is our first priority, so we need you to be prepared and aware of your surroundings at all times. If you have any questions or need assistance, contact the nearest event staff, key volunteer or your group leader. Event staff and key volunteers are outfitted in colored safety vests and/or event branded gear so they are easily identified. Violations of these policies may lead to disciplinary action. Race Organizers have the right to refuse or dismiss a volunteer in the event these policies have been violated. Enjoy your time as a volunteer – have fun! You are one of the reasons that race participants love coming back every year. We value your kindness and commitment to the event. Do not bring personal belongings. Volunteers are strongly discouraged from bringing personal belongings to the event. Gear check will be required for belongings that cannot be carried in a volunteer’s pockets, including personal bags, purses, backpacks or similar items. Bring an ID. Volunteers will be required to provide photo identification at Volunteer Check-In in order to volunteer. School IDs are accepted. Check the weather and dress appropriately. It is important to prepare for the weather if you are volunteering outside, so bring enough layers/options of clothing to ensure that you will be comfortable for the duration of your scheduled shift. Follow best practices when working with food and/or liquids. Volunteers must wear gloves, pull long hair back in a secured ponytail and sanitize their hands before working and after visits to the restroom when working with food and/or liquid. Adhere to social media etiquette. Volunteers are encouraged to like and follow the event on Facebook (www.facebook.com/ChiShuffle) and Twitter (@ChiShuffle). During your volunteer shift, we ask that you focus on your event role and discourage you from posting to your social media accounts. Additionally, volunteers are prohibited from posting sensitive event information on social media. If you do reference the event in social media, be sure to define your association with the event (i.e. volunteer). Familiarize yourself with the Event Alert System. 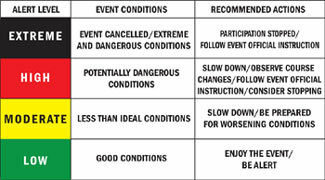 The Event Alert System is a color-coded system used to communicate the status of course conditions to participants leading up to and on race day. The levels range from Low (green) to Moderate (yellow) to High (red) to Extreme (black) based primarily on the weather, as well as other conditions.